Heretic Sangheili are former Covenant Sangheili that rebelled against the Covenant's High Council during the events prior to the discovery of the second Halo ring. They are the main components to Sesa 'Refumee's heretic faction. These Sangheili were once part of the artifact retrieval group led by Sesa 'Refumee on Threshold's gas mine. During an expeditionary patrol, the Sangheili encountered the caretaker of Installation 04 and were informed of Halo's true purpose. The Sangheili remained loyal to 'Refumee after this revelation and made the gas mine facility as their base of operations. They also set up a makeshift camp on Basis, Threshold's moon. Although most lines of outside communications had been severed by 'Refumee when he came into contact with the Oracle, one Heretic Sangheili, Kola 'Baoth's brother, succeeded in sending out scattered messages that detailed newly encountered truths. Most, if not all, Heretics on the gas mine perished when the newly appointed Arbiter Thel 'Vadamee assaulted the facility and plunged it down into the gas giant. Heretic Elites do not wear helmets like their Covenant counterparts, but instead don breathing apparatus to assist in respiration on the Gas Mining facility. Heretic Elites also have four fins on the back of their armor, similar to the traditional armor seen on Ripa 'Moramee's clan brothers in Halo Wars: Genesis. Sesa 'Refumee does not share these fins, but instead has a jet pack on his back nearly identical to those used by Elite Rangers (Halo 2). Heretic Elites can be found in both brown and gold armored variants, as well as the Heretic Leader's personal red-colored armor. Elite who wear gold armor are the equivalent of Elite Majors with more health and stronger shields, while those with brown armor seem similar to Elite Minors. They are only seen in two Halo 2 levels: The Arbiter and The Oracle. A glitch causes the melee attacks of Heretic Sangheili to have little or no effect, unless they are wielding Energy Swords. However, their melee attacks have a small chance of hitting when standing to the left of the Sangheili. A class of Elites known as "Heretics" appear in Halo: Reach, but these are actually just Elites using human weapons, rather than rebels. They only appear in Firefight. Heretic Sangheili Minor in Halo 2. A heretic Sangheili Major in Halo 2. A Heretic Major with a Sentinel beam in Halo 2. Heretic Sangheili Minor in Halo 2: Anniversary. Heretic Sangheili Major in Halo 2: Anniversary. A Heretic Sangheili in Halo 2: Anniversary. 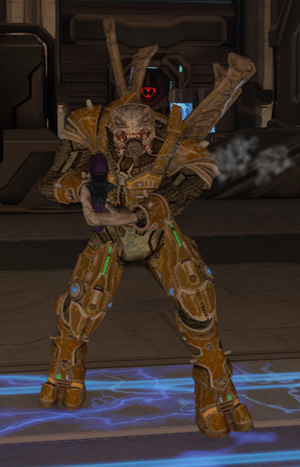 A Heretic Sangheili with a Type-1 energy sword.